Rather reluctantly we set forth for the next leg of our NZ odyssey. 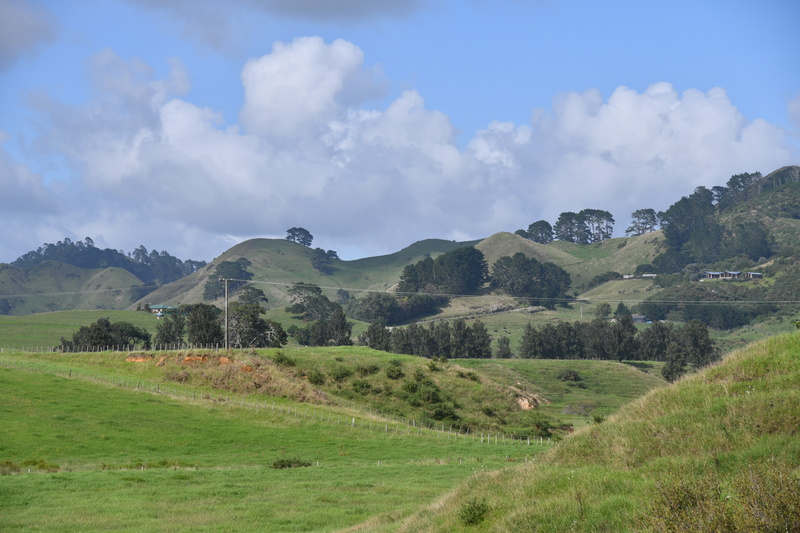 Reluctantly because we are completely charmed by Waihi Beach resort – so neat, orderly, clean, friendly, warm, happy and, I guess, quite wealthy. Our hosts at the Waihi Beach Lodge, Greg and Ali were the most thoughtful and generous of people. The kind who give you a warm feeling on meeting. Their small accommodation unit is home from home – charmingly decorated, comfortable, perfectly kitted out with its own compete kitchen including a fridge stuffed with wines and beers. Every possible requirement for the travelling visitor has been thought of and provided. Ali even provides home-baked shortbreads for afternoon tea and a farewell carton of home-made muffins for our onward journey. Waihi Beach Lodge even features in the Lonely Planet guide to NZ, and Greg acts as the L.P. correspondent for each new edition on what’s to know around Waihi. What a discovery! We have to cover 360km to Napier, our next stop, and we take in Rotorua and Lake Taupo en-route. It is warm again (29°C) and dry, though somewhat overcast. 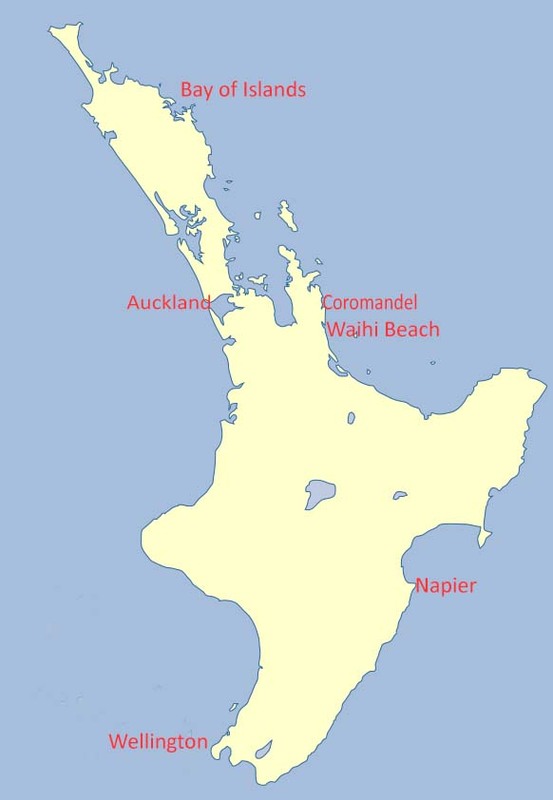 The coastal strip is very fertile and is covered in Kiwi fruit farms and avocado plantations. The scenery is a little forbidding as the groves are surrounded by protective hedges of closely planted Cypress which grow to 6m or 7m in height. Through the occasional gap we spy neatly tended rows of Kiwi vines trained on pergolas and similarly regimented avocado trees – about the same size as apple trees. Ali, our hostess, was bewailing the high cost of the, as yet un-travelled, produce. There is no farm-gate shopping as the farmers’ eyes are on the export markets. As we enter open country we are surprised by the terrain. The whole area is lumpy. Small hills are dotted around randomly, a bit like the UK’s southern peak district, though smaller and more frequent. Are they volcanic? There are no craters. Are they miniature Alps, for this area site astride and active plate boundary? We have no answer and would welcome enlightenment. By coffee time we have reached our first pit-stop, Wai-o-Tapu just south of Rotorua. There is a fault line across the island running NE to SW as the Pacific tectonic plate is being subducted under the Indian / Australian plate. 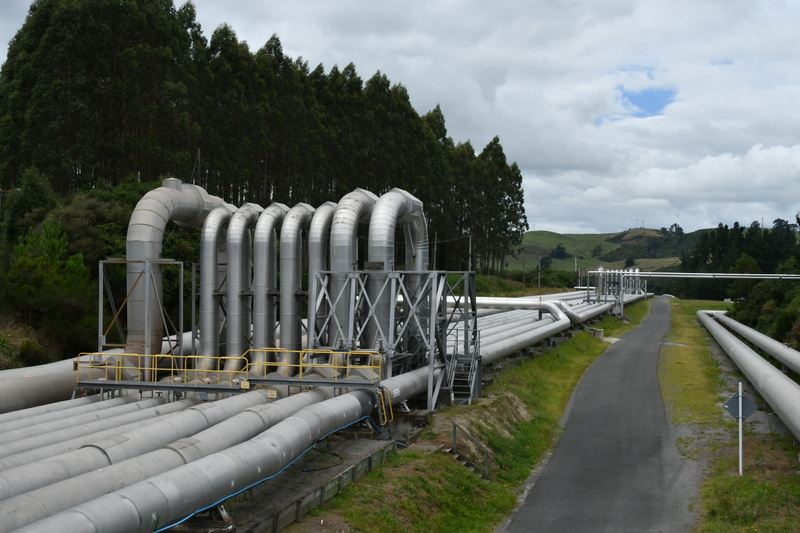 The result – oodles of geothermal activity which provides about 5% of NZ’s electricity, lots of free warm water to breed shrimps (a curious but doubtless lucrative inland industry) and the occasional catastrophic earthquake (viz Christchurch in 2010 and again in 2011). 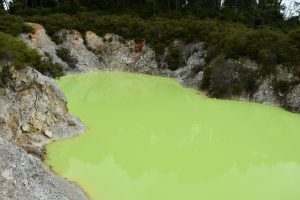 Anyway this place is a must for hydrogen sulphide sniffers and connoisseurs of boiling mud pools. 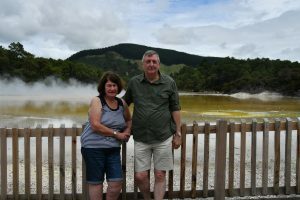 We visit Wai-o-Tapu (Maori for sacred waters) and join throngs of Russians, Japanese, French, German and American groups coached in from their cruise ships. Gosh they are noisy. But we pay our dues and wander along the carefully laid paths and board-walks to view prosaically named “Devils lakes” (boiling mud), “Satan’s canyons” (sulphurous steam wells), “Champagne pool” (effervescent) and so on. All very well curated, obsessively safe with a catch-penny shop at its exit. Good fun, though we much preferred Lake Borgoria in the Kenyan rift valley, a similarly exuberant geo-thermal outlet, where for a few shillings a chap wearing flip-flop shoes dips a plastic carrier bag of eggs tied onto a long stick into the super-heated pool and offers you a hard-boiled couple for lunch. Onward towards Lake Taupo, our lunch stop. This is the most amazing lake, 25 km across. It is the flooded caldera of a volcano that began erupting about 300,000 years ago and blew out 750 cubic km of ash and pumice, making Krakatoa (8 cubic km) look like a pimple. I am glad we weren’t around for either. Lake Taupo is a wonderful playground for sailors, water skiers, para-ascenders, fishermen, lake golfers (you heard it from me first) and more, and a substantial town dedicated to the pursuit of pleasure and little else sits on its northern shore. 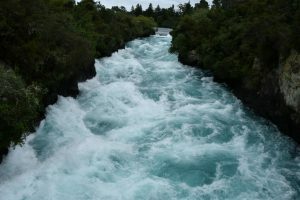 NZ’s longest river, the Waikato, flows north out of Lake Taupo and on its way slams into a narrow chasm making a dramatic 10m drop into a surging pool. These are the Huka falls. You just have to see this white-water canoeist’s nightmare. I don’t believe anyone has survived falling into this maelstrom. The river flows on more sedately from here emerging into the Tasman Sea just south of Auckland. 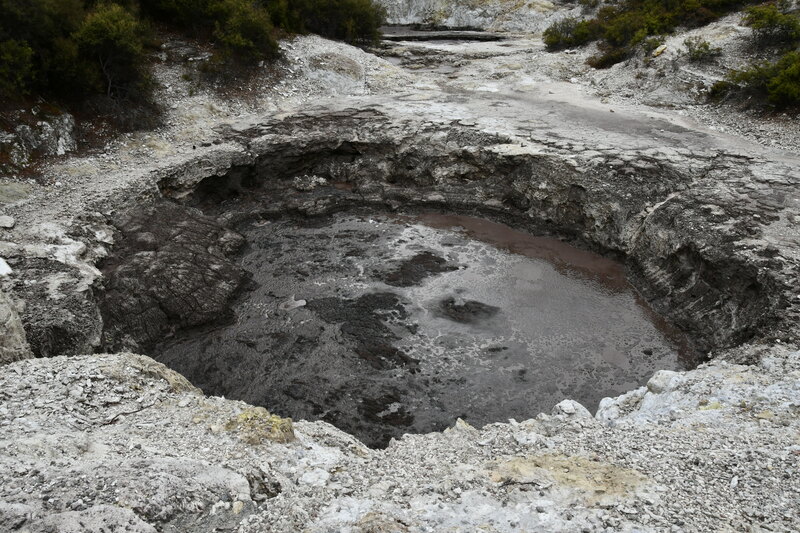 From Taupo is a dramatic 150km drive through the Ahimanawa range of mountains. Through these steeply forested slopes the road follows a series of gorges with narry a building, a shop, a turning off, a petrol station nor any civilisation for its entire length. Lord help anyone who hasn’t topped up his tank and checked his tyres before this journey. Needless to say David sees this a golden opportunity for a speed-trial and overtakes every vehicle possible. We arrive in Napier safely and check into our hotel. This entry was posted in New Zealand 2018 on 19 February, 2018 by David.